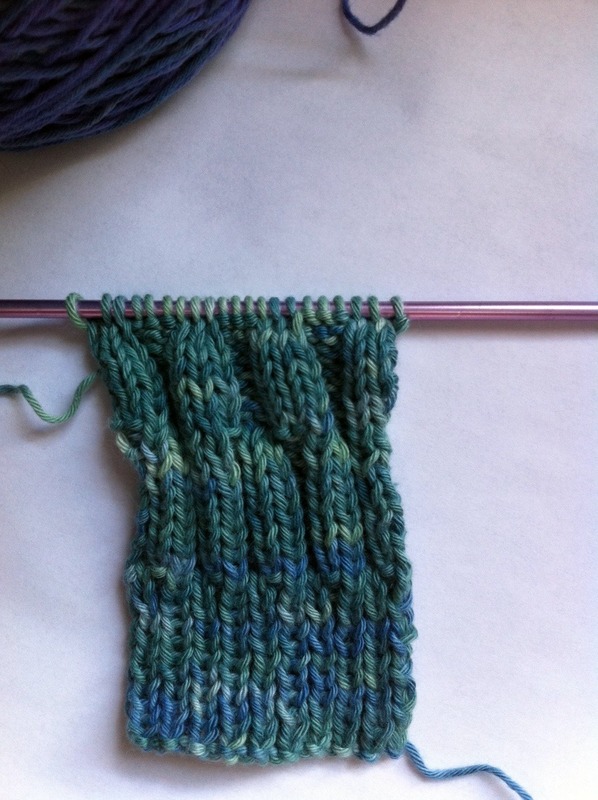 Add a little kick to your stockinette stitch! Twisted Stockinette stitch is very simple to do; the only difference from regular stockinette stitch is you will be knitting the stitches through the back loop to twist them. Like regular stockinette stitch though, your fabric is going to have some curl to it. You can help the curl a bit by adding a border. A simple garter stitch border will do the trick nicely. Seed stitch will also work. For a border, just work a few rows in garter or seed stitch before you begin knitting in twisted stocking stitch, then the same number of rows again in garter or seed before binding off; add extra stitches to the beginning and end of each row as well to be worked in garter or seed stitch. This probably won't eliminate the curl completely, but it does help. 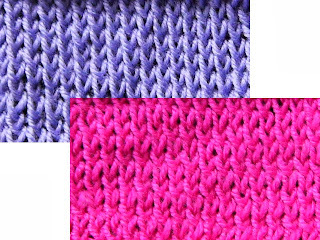 I will show you two different versions; the pink yarn is what I learned as Twisted Stocking Stitch, but it is also known as Zig Zag or Crossed Stocking Stitch. The one knit with purple yarn is given in Barbara A. Walker's First Treasury as Twisted Stocking Stitch. Both versions are worked on any number of stitches. Here is a video showing both of these versions. Happy Knitting! Last time, I talked about your basic ribbing (1x1, 2x2, etc.). 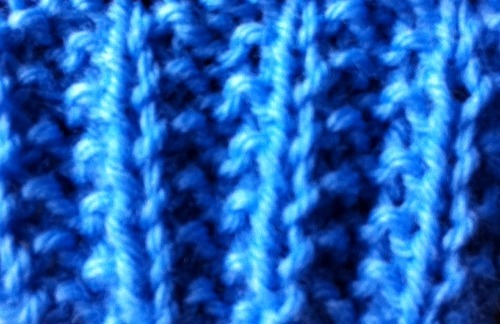 But rib stitch doesn't stop there. This time I'm going to show you how to do some other types of ribbing. These stitches are a little more fancy, if you will. So if you're tired of ho-hum ribbing, get your needles ready for a new experience! 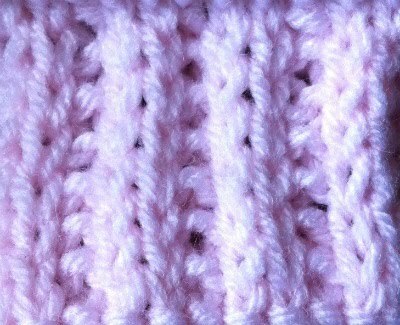 The above are just a couple of the variations on the rib stitch. 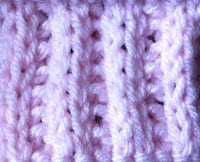 I will be posting additional rib stitch patterns in the future, so be sure to come back! Here is a video on each of the above. In the photo to the left, I've knit ribbing in K1, P1 then K2, P2, and finally K3, P3. You can knit ribbing any way you like. Try K2, P4 or K3, P2 or whatever you feel inspired to do. One thing to remember about ribbing is that it tends to pull in, so take that into consideration when designing your project. You can use the pull to your advantage for some light waist shaping of sweaters; 2x2 ribbing is the most stretchy, and is good for cuffs, necks, and the like. 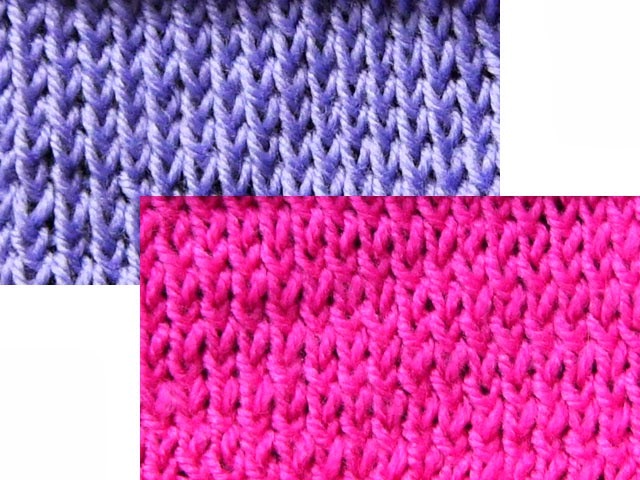 Below are instructions for 1x1, 2x2, and 3x3 ribbing; don't be afraid to try other combinations though. You are only limited by your imagination! And if it doesn't work out the first time, it's only yarn. Rip it out and try again. Here are videos for each of the rib stitches above.